Home And Away star Nicolle Dickson is to be reunited with her former on-air partner Alex Papps on the English stage. Papps, now starring in The Flying Doctors, and Dickson, who has just married fiance James Bell (pictured, with Dickson and Papps), will co-star in the production of Cinderella to be staged at the De Montford Theatre, Leicester, over the Christmas break. ‘The Hurricane’ roars back in! The “Burrigan Hurricane” is on her way back into Wandin Valley! Matron Hilda Arrowsmith (June Salter) is returning to the popular A Country Practice. “Yes, she’s about to wreak havoc once again!” says Salter. “Once every 12 months I get called in to upset the applecart and try and lure someone away from Wandin Valley to join me at Burrigan Hospital. The victims this time are the new matron, Ann Brennan (Mary Regan) and Dr Terence Elliott (Shane Porteous).” And with the doctor bedridden due an injured foot, he is an easy target for the fiery matron who also has a keen eye for him. Dr Elliott decides that as he wants to get information from her, he gives the impression that he feels the same way about her. The scenes between the two were said to have the crew roaring with laughter. After a five-year absence, Bert Newton (pictured) is returning to the Nine Network as a guest contestant on Sale Of The Century as part of the show’s tenth anniversary. The week-long Celebrity Challenge will also feature celebrities, politicians and sports stars including Cameron Daddo, Peta Toppano, George Negus, Lisa Curry-Kenny, Simon O’Donnell, Andrew Gaze, Gough Whitlam and Don Chipp. “We’ve been talking about doing a ‘celebrity Sale’ since 1981 so it’s very exciting to see it happen,” host Tony Barber told TV Week. Steve Vizard is planning to send his Tonight Live show on a trip to the UK, with a week of shows to be hosted from London in September. Vizard is keen to have the show “travel” from its Melbourne base more often, with more regular trips to Sydney in the pipeline. Wheel Of Fortune host John Burgess has said there is pain behind his on-screen smiles, due to arthritis and injuries caused by a tennis career as a teenager. “I’ve had problems for a few years,” he tells TV Week. “It’s a legacy of playing tennis seven days a week for 12 hours from when I was nine to 19.” And while flying his weekly commute from Perth to Adelaide does his injuries no help at all, he insists that the show must go on and the show’s popularity helps numb the pain. “The show has been number one for the past two years,” he says. The Sunday night ratings battle steps up a notch this week with the series return of ABC’s That’s Dancin’. Due to its popularity last year the series has been extended this year from 13 to 21 episodes and there are plans to expand the format with a book and video to be launched. There are also negotiations with a US network to create a local version there. Saturday: HSV7 crosses to Brisbane for AFL between Brisbane Bears and Essendon. ABC’s late night movie is the acclaimed Citizen Kane. Sunday: ABC presents the series return of That’s Dancin’, hosted by Paul Newman and Maureen Delacy with guest judge Rhonda Burchmore, as competitors aim for the title of 1990 Australian Television Dance Champions. Sunday night movies are The Color Purple (GTV9) and Eyewitness (ATV10). HSV7 presents the debut of mini-series From The Dead Of Night. HSV7 then ends the night with an 80-minute special, Classic Hits, in simulcast with Melbourne’s new FM station, TTFM 101.1, which had launched the night before. Monday: GTV9 starts its annual two weeks’ coverage of Wimbledon, starting each night at 10.30pm and continuing through to 4.30am. Tuesday: HSV7 crosses to the WACA for the live telecast of AFL State Of Origin between WA and Victoria. Sandy Roberts, Dennis Cometti and Bernie Quinlan head the coverage. Thursday: In Beyond 2000 (HSV7), Andrew Carroll looks at a possible solution to save the Leaning Tower of Pisa from falling over. 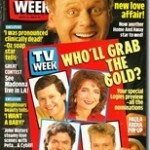 Source: TV Week (Victoria edition), incorporating TV Times and TV Guide. 23 June 1990. Southdown Press.